I have spent the last two days in and around Manchester collecting donations for the Center for Computing History. As usual I met some great people and picked up some really interesting items, but I have to say the highlight of the trip was meeting with Steve Furber. For those of you who dont know, Steve is one of the key people (along with Sophie Wilson) responsible for designing the legendary BBC Microcomputer for Acorn in the early eighties. 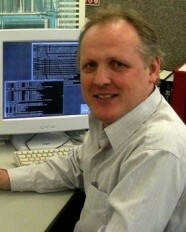 He is now the Professor of Computer Engineering at Manchester University and was awarded a CBE in 2008. Since I was collecting computers for the museum I made the trip in a fairly large van. Here's a tip for anyone wanting to take a large van to Manchester University. Don't ! We finally got back to his office, set up the cameras and conducted the interview. I'd like to publically thank Steve for his help. Thanks Steve !